Australia-based mobile virtual network operator (MVNO) Zero Mobile has been struggling to find a strong foothold in Singapore’s competitive mobile space. In a bid to rebound, Zero Mobile has issued a “direct challenge to the incumbents”. It is increasing its monthly data limit from 30GB to 45GB, and slashing S$10 off its unlimited data mobile plans. The Zero X plan will be reduced from S$59.95/month to S$49.95/month, while the Zero XS plan will be reduced from S$49.95/month to S$39.95/month. The slashed pricing will be valid for six months, and for Zero XS, the pricing will be applicable when a postpaid customer switches over from another provider until further notice. While both plans offer unlimited data, Zero X comes with unlimited calls and SMS; Zero XS provides 100 minutes of local talktime and 50 SMS with no lock-in contract. 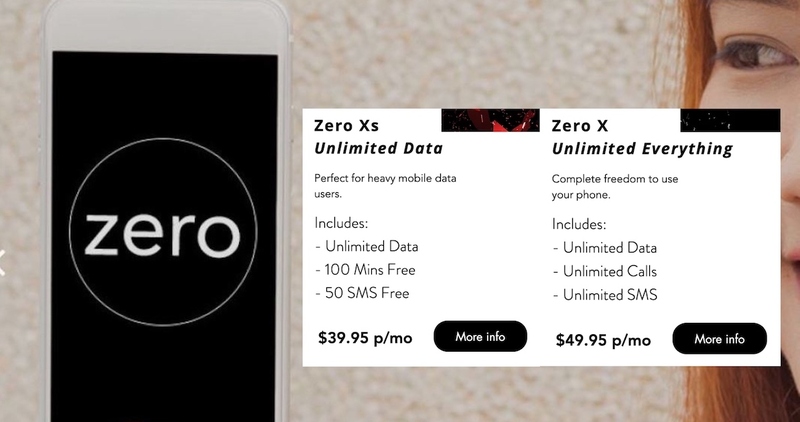 Comparing Zero Mobile’s plans to rival plans, the Zero X plan takes on M1’s mySIM3 98 plan, which is a SIM-only plan with a 12-month contract that costs S$98/month for unlimited data. Meanwhile, the Zero XS plan contends against Circles.Life’s S$18 base plan, S$20 unlimited data and S$2 incoming calls add-on. “Competition in any market is healthy, which is why we are perplexed by the overly aggressive response by the incumbents against new entrants, (seemingly) to disallow players like us from establishing ourselves as a viable alternative for the Singapore consumers,” said the company in a press release. Zero Mobile leases mobile network capacity from Singtel, similar to another MVNO, Zero1. Circles.Life does the same with M1, while MyRepublic has an agreement with StarHub. When Zero Mobile first launched in Singapore, its referral scheme which rewards subscribers with lower monthly fees, drew flak for being a “multi-level marketing scheme”. In response to this, Zero Mobile CEO Glenn Mohammed said it is fine-tuning the scheme and will reveal more details “in the next fortnight”. He added that the firm had been facing other “significant issues” over the last year. The CEO said that Zero Mobile had been “let down” by some partners and suppliers, but declined to elaborate further on it. He also shared that the firm faced a “much higher level of delinquency than expected”. Specifically, a “very high number” of subscribers defaulted payment to them for months. “Another issue was abuse of service where, due to some technical limitations earlier on, the data usage wasn’t being controlled,” Mr Glenn told CNA. Despite these challenges, Mr Glenn said that it is confident to rake in more revenues beyond just the mobile service itself, but from adjacent markets like advertising, shopping, and invites. “As a mobile provider, we are in a unique position of trust with our customers and if only we can provide them additional services, we would be able to gain all the lost revenue from other channels,” he told CNA. He also shared the company’s ambition to achieve 2 per cent of Singapore’s postpaid mobile market by end-2019. There are also plans in the pipeline to establish Singapore as its permanent base so it can manage its product in Australia and the United States from here. “This is the reason why you do not see us jumping in the market with a S$20 product and the intention to just acquire as many subscribers as possible,” said Mr Glenn, in reference to competitor Circles.Life.